Environmental water delivery to the Goulburn–Broken wetlands in 2014–15 focused on re-establishing vegetation and providing habitat for bird breeding after wildfire ravaged a number of the wetlands in early 2014. Fire spread through Black Swamp, Moodies Swamp and Kinnairds wetland in February 2014, burning the wetlands and surrounding vegetation. Moodies Swamp received 500 ML of environmental water in late 2014 to promote suitable brolga breeding habitat. Jo Wood, Environmental Water Project Officer with the Goulburn–Broken Catchment Management Authority said, "Brolga were sighted on numerous occasions feeding and showing displays of courtship at Moodies Swamp following environmental watering." 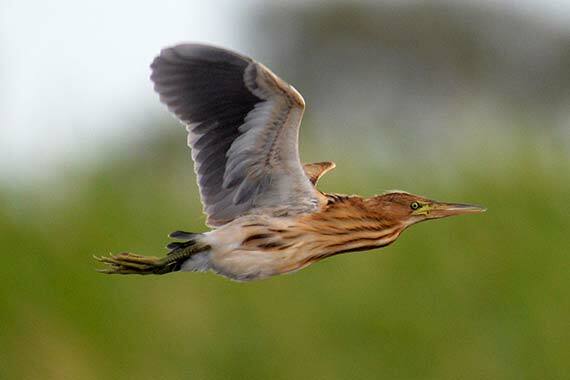 "In addition, the endangered Australasian bittern was recorded at the swamp for the first time in September 2014. Environmental watering also supported the growth and establishment of wetland plants." Though Black Swamp and Kinnairds wetland did not require water in the 2014–15 financial year, the wetlands displayed the benefits of the April 2014 environmental watering. Black Swamp and Kinnairds wetland underwent dramatic changes. "After environmental watering in April 2014, many wetland plants emerged at Black Swamp, including common swamp wallaby-grass, common nardoo, myriophyllum, potamogeton and river swamp wallabygrass, which is listed as a 'vulnerable' species under the Commonwealth Environmental Protection and Biodiversity Conservation [EPBC] Act" Jo said. "The EPBC-listed rigid water-milfoil was recorded in parts of Kinnairds wetland, as was slender water-milfoil, which is listed as a threatened species under Victoria's Flora and Fauna Guarantee Act. Neither had previously been recorded there." In spring 2015, the Goulburn–Broken Catchment Management Authority, with the assistance of Parks Victoria and Moira Shire Council, will be planting river red gums and wetland plants at Kinnairds wetland and Black Swamp to help recovery. Reedy Swamp entered a drying phase in 2014–15, helping to improve the condition and diversity of the wetland's vegetation. Drying phases enable semi aquatic plants to grow, seeds to germinate and establish and oxygen to penetrate the soil.